‘Cycle agnostic’ is a term that often creeps into the marketing literature of hedge fund managers. Often, when the crunch comes, as it has for so many fund managers in recent months, this turns out to be an idle boast. For Arrowgrass Capital Partners, however, it is a mantra that underpins the firm’s entire approach to money management. Arrowgrass has grown out of the market leading convertible bond franchise at Deutsche Bank, which was set up in 1998. The team was renamed DB Omnis and moved over to its own proprietary platform in 2004. In 2007, Deutsche felt that DB Omnis would be more effective as a revenue generator if moved outside the bank, hence the creation of Arrowgrass as a stand-alone venture. “The trading strategies that we wanted to emphasise at the top and bottom of the cycle, namely merger arbitrage and distressed, we couldn’t implement within Deutsche,” says Henry Kenner, Arrowgrass’ CEO. Deutsche still liked the strategy, but realised it was not going to work internally, because of the existence of the bank’s restricted list: necessary part of its corporate finance activities, coupled with the presence of Deutsche’s flow business presence on creditor committees governing corporate restructurings in which the DB Omnis team was also involved. For example, in Q4 2007 DB Omnis was restricted in 40% of all European M&A deals closed year to date. A spin out would strip away these conflicts of interest, and allow Nick Niell, Arrowgrass’ CIO, and his team to get on with their jobs without having to worry about treading on Deutsche’s toes. Deutsche maintained its risk commitments at spin-out and took an equity stake in Arrowgrass. Arrowgrass looks at a range of interdependent strategies, employing the multi-discipline skill-sets that already exist within the firm to understand the risks and opportunities of cross-asset class and strategy correlation (see Fig.1). This depends on the portfolio managers having a good idea of where they are in any given economic cycle. There is no single strategy at work here but an ongoing reallocation between different strategies according to cyclical forces. Multi-factor analysis helps to identify non-consensus opportunities in individual trades, while risks are hedged at the portfolio level. Arrowgrass doesn’t take any macro deltas when it comes to recalculating risk: each instrument is recalculated individually so that any tail risk that emerges can be easily clarified. Barty writes the correlation set the firm uses in addition to utilising empirical correlations from the past. The fund is managed and stressed to ensure no more than a 2% drawdown for a 5% move in the S&P. Barty and Niell work together to implement macro hedges to neutralise sector risk or bucket risk, and sometimes this will require a more idiosyncratic hedge. 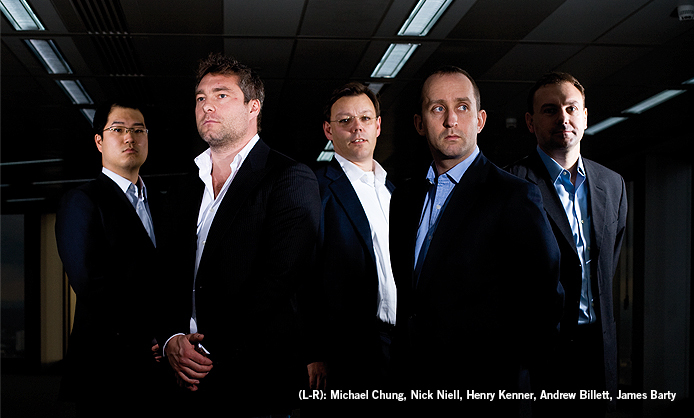 Arrowgrass’ analysts tend to be from a distressed background, historically. Kenner takes the view that they can, therefore, cope with the demands in the merger arbitrage space as well. Fundamentally, they are deep value professionals. This does not mean that Arrowgrass will shy away from a distressed opportunity at the top of the cycle, but as Kenner points out, there haven’t been a great deal of attractive deals until recently. Consequently, the firm has, in the past, been focusing on areas like post-reorganisation equity and ongoing financing trades. The right time for distressed? For Michael Chung, who is responsible for the distressed strategy at Arrowgrass, distressed investors fall into three camps at the moment: those who never touch the strategy, period; those who anticipated the downturn too early and allocated to distressed funds, but lost money as a result; and finally investors who are interested, but are still wondering whether it is still too early to commit capital. Early this year, as the banks were looking to offload some of their loan portfolios, private equity funds starting picking up some of this action, and some of the active distressed players followed them in, using total return swap (TRS) programs. Yet the TRS programs employed were not as robust as those being used by the private equity community. The net result of all this was that these loans went down in value, and many funds were hammered. The key was not the skill set or the quality of the loans themselves, but more about the availability of leverage; fundamental to the pricing of the business. To buy loans at 90 cents on the dollar and have them paid at par, meant you didn’t lose money, but to generate a decent return, you still needed leverage (which had dropped out of the system). The Arrowgrass approach is heavily resource intensive, particularly when participating in the private market. It requires a team culture and solid infrastructure support (see Fig.2). It is not the sort of strategy that relies on a small, lean firm to keep costs down. There are currently 50 personnel, including a three-person full-time legal team. To participate in private deals, the fund manager needs on-tap legal capabilities, including one individual who supervises the group’s 19 legal entities. In total, there are 28 jobs devoted to maintaining Arrowgrass’ infrastructure. “It is part and parcel of what being a hedge fund is all about these days,” says Kenner. Arrowgrass pursues a global mandate but, historically, its focus has been European (see Fig.3). There are not many other funds focusing on European distressed, and those that are, like Avenue Capital, have a bias towards larger deals. Chung says he is seeing less and less competition in deals: the banks are simply not turning up in the numbers they used to. Jurisdictional issues remain huge in Europe. Each country has its own legal code with which a successful fund needs to be familiar. As Kenner explains it, “it’s not like you can just wade in and get on with it.” This is why Arrowgrass has concentrated on a small number of markets, like Spain, Portugal, the UK and Ireland, rather than adopting a pan-European approach. It has tended to avoid Germany due to Deutsche’s active presence there, plus action from a lot of large US funds in recent times. In countries like Italy, ongoing legal and political issues mean the distressed market is treated with caution, and in France, bankruptcy and credit protection legislation is still largely untested. Employees, shareholders and creditors can all have a stake in developments, and the situations may be a great deal more complicated than they are in the US, which has the benefit of a fairly uniform legal code. A lot of big US distressed players had research outposts in London a couple of years ago as they sought new opportunities in the European market, especially Germany. This was driven by a lack of deal flow in the US, but since the end of last year they have been absent from many situations, leaving Arrowgrass and a few other specialist distressed funds with a much freer hand. At the end of last year and the beginning of this year, convertible arbitrage was viewed as a volatility play, but the end of access to leverage and the increase of margin requirements by prime brokers, coupled with the fact that 70% of the market in convertibles was held by leveraged hedge funds, has really cut the legs out from under the strategy. With over twenty years of experience, including seven years with Deutsche Bank, Kenner was the head of convertible asset swap trading , and head of Japanese and Asian convertible bond trading at Deutsche. He has also worked for Swiss Re Capital Management, where he was a managing director and co-head responsible for equity and equity derivative investment strategies. He has also been a managing director and co-head of equity derivatives at ABN Amro. A managing director at Deutsche Bank for nine years, Niell has been working in financial markets for two decades. He was the youngest member of the Deutsche Bank Global Equities Management Committee and the youngest member of the board of Deutsche Morgan Grenfell in the UK. He has headed teams involved in structured equity and corporate finance, European equity derivatives and special situations. James Barty was a managing director for Deutsche Bank for five years out of a total of twenty years in financial markets. Amongst the positions he has held are chief equity strategist, global head of tactical asset allocation, head of pan-European equity strategy, co-head of global economics and European economics, and chief UK economist. A senior credit analyst in the Deutsche Bank global convertibles team, Chung has also been head of event driven at Omnis. He has a six year track record specialising in distressed and special situations and was also a senior analyst in the top-ranked Lehman Brothers’ distressed team. Andrew Billett joined Arrowgrass in 2008, from Walter Capital Management, a subsidiary of SAC Capital, where he was a partner and portfolio manager. Prior to this he spent five years as a portfolio manager with Meditor Capital Management. He began his investment career as a graduate trainee with Singer & Friedlander in 1996, spending four years with the firm before moving to Meditor in 2000.